How Adaalo works for sellers? Give your ad an attractive title. Think of words that people would use to search for your Ad. Check the spellings and do not use CAPITAL LETTERS or symbols. Buyers prefer ads with realistic prices! Consider age & condition of the item. Items with good description sell faster! Include the brand, model, age and any included accessories. Mention the condition, features and reason for selling. If the item is still under warranty, mention it! Remember, a good description needs at least 2-3 sentences. Do you want users to like or dislike your ad ? Correct user name build trust. Do not use symbols and numbers in your name. Replies to your ad will be sent to this email. It will be kept confidential. Do not add +91 or 0 before the number. Adaalo offers free services for ad posting in india. Its Also offers post free ad for buyers & sellers who can list their products free on our platform.In Adaalo you can now buy sell or rent or find job or sell your business services or business opportunity across India. This online post free classifieds is designed to help your advertisement to reach out to many buyers and sellers, It is Enabling you to choose from a wide range of options online. 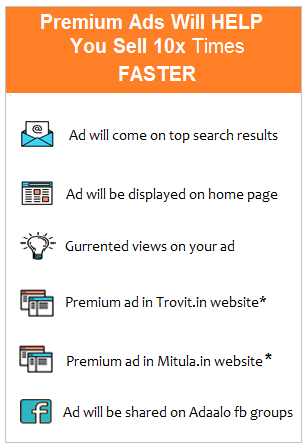 Don’t wait just start posting your ads in India on our top categories. Cars & Bikes Classifieds. Mobiles & Tablets Classifieds.Electronics & Computers Classifieds. Real Estate Classifieds.Jobs Classifieds. Education & Learning Classifieds. Home & Furniture Classifieds. Pets & Pet Care Classifieds. Entertainment & Events and Services Classifieds. One of the best free classified ads post sites in India where you can post ad from any select city in just 5 secs. feature of live chat with buyers & sellers. We also offer virtually all items for sale on our platform. be it cars & bikes ads. real estate ads. mobiles & tablets ads. home & furniture ads. jobs and a host of services ads. 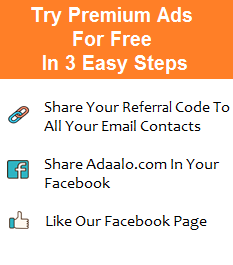 Try our Premium Ads in 3 Easy steps for more coverage.Adaalo offers post free classifieds ads and Top most Ads Website. Copyright © 2019 Adaalo.com All Rights Reserved.